RICH NOVEK So What Flows? So many of today's "so called" spiritual leaders walk as a house divided against themselves because they refuse to let Christ alone be their ALL sufficiency IN every situation they face! This is why the leaders who are thought to be mature can have their REAL maturity tested at any time just by letting God touch what is really at the center of their life, that being what flows out from their belly (center). The only litmus test for REAL Christian maturity is found IN the personal "losing to gain" message of the Cross, anything else is just earthly minded performance based religion, no matter what powerless form it may take! A sister writes:"The law was fulfilled in Jesus, it was not done away with. There is a huge difference and one which is not being properly taught today." No No. The Word and the Spirit always take the Church higher and higher, and Jesus opened the door with all His Father's care teaching, plus the dynamic spiritual principle of GIVE and it shall be given you. All previous forms of priesthood were nailed to the Cross. 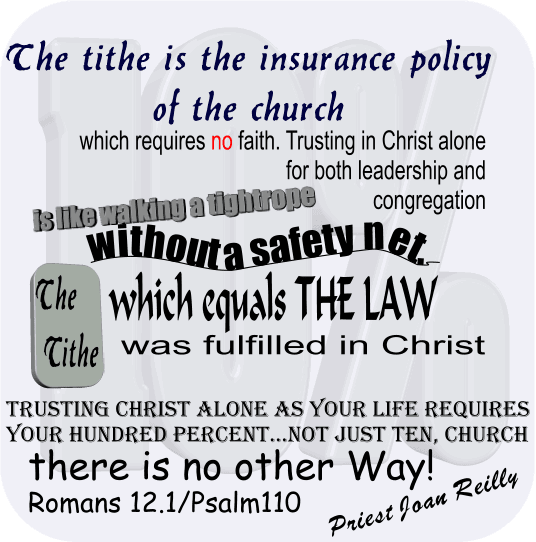 There is absolutely no tithe now. WE ARE THE PRIESTHOOD. We GIVE FIRST and FOREMOST to the household of faith and none more than those LIVING and MINISTERING BY FAITH. Psalm 110 shows if we want to walk in POWER we have to give voluntarily. The threefold fragile crucible of the relationship of full and part time ministry, the hearers/Body, and the Holy Spirit who direct all sons of God, are the flimsy weak vessel which hold the very POWER of GOD ALMIGHTY. It is the "good idea of man and accountants" to construct systems and New Carts like King David, so we don't need God. All the old Testament picture forms of Levites, of walking 6 steps then sacrificing, of the 10th,.....are now dead in the water because everybody now knows the Lord from the least to the greatest, and because of the dynamic which is truly supernatural of give and it shall be given unto you. Every naysayer at this point mentioning that nobody is like that must remember that in the 50s nobody was baptised in the Spirit either , only an obscure bunch called Pentecostals. In other words if we preach the New Covenant of Jeremiah 31 we will GET the New Covenant of Jesus....if we carry on preaching Judaism that's what we get in our churches and no power, no revival, not many born again,dreadfully immature saints, and lots and lots of endless moneyproblems, building problems, pastors committing adultery because they are bored and effectively stealing God's own money from the saints. All God's money has a direct purpose. If you pastor, then you transfer the life of Jesus as quick as you can like St Paul, then hear what the Holy Spirit says next. All this endless "leaven of the Pharisees" coming from endlessly recycled manna and Bread from the 60s , 70s and 80s...instead of following the I AM GOD, who is speaking NOW...has to stop. I read Jack Fortenberry's book Corinthian elders and was impacted...but today as I read Joan Reilly's words I felt the most searing anger about the robbing of saints, and true ministries such as Elaine and George. I have never felt such disgust from God's Spirit for tithing....that it locks up God's own money that He demands is used for orphans widows, sick, prisoner's familes,people who genuinely minister living as the "real" household of faith, and doing precisely what the Holy Spirit tells them. Countless multitudes are not HEARING the gospel...there is no money to send workers to them....nor are being impressed by the gospel, because God's people are unable to shower outsiders with unconditional love gifts and supply...because false ministers who preach backward, lame, leavened gospels are stealing it from those God has designated it for. People like Elaine have given everything. She is as rare as hen's teeth. She has to beg, borrow and steal (not really steal lol) for the work that God has laid on her heart. She lives with the people God has placed in and on her heart. She gives up a life of ease and comfort to live in a manner most people would run for their lives from. She does all this out of the heart of the Father. She calls her Father Dad. She knows Him as her Dad. I hope to know Him that way too. I want to see her Dad provide for her needs and the needs of the ones He loves through her in such a way she will not be able to contain it. I want our Dad to prove His Word in and through her and people like Rich and Linda Novek who have literally laid down their lives for their friends in sharing the Real Gospel. Joan Reilly :Chris Welch is another I want to see unable to contain God's blessing. You speak an unpopular Truth and pay a heavy price. It's not an easy walk you have been given to walk, but it's Life to those who find it. For those who think you are angry or un nice, may God finally give them "ears" to hear what the Spirit of Christ In you is saying. Word. Let us expect the evidence of His pleasure.